The Brick Castle: Stabilo Early Writing Materials for beginners. My 6 year old is becoming a confident writer now. He's speeding up and isn't intimidated with having to write sentences or lists,and we're really proud of him. Our nearly 5 year old is still at the stage where writing his name is great, but anything more is tricky, so requires a lot of effort. Correct pencil grip is vital at this stage so that neither of my boys have bad habits from the start. 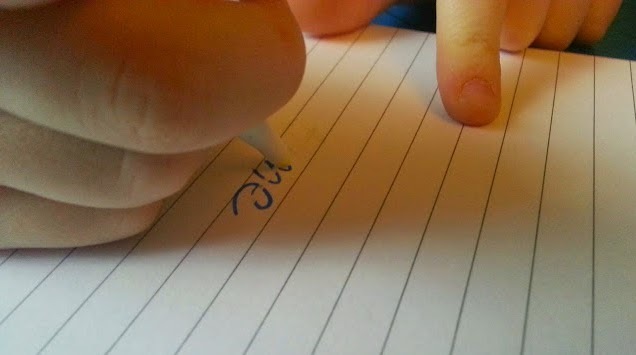 Holding the pen or pencil correctly means less strain on your hand and arm, neater handwriting and more pleasure from writing. 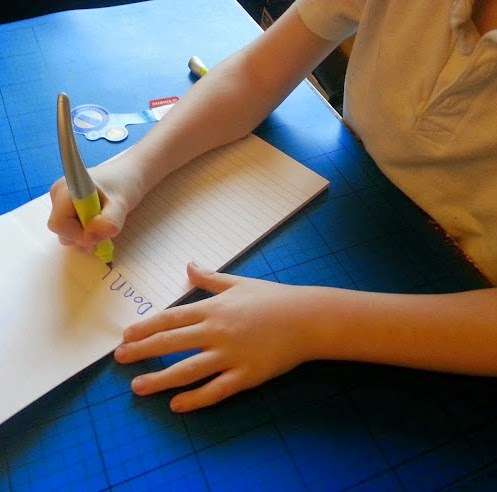 Stabilo have a great range of products to help children who are learning to write, and they've sent us some for review. 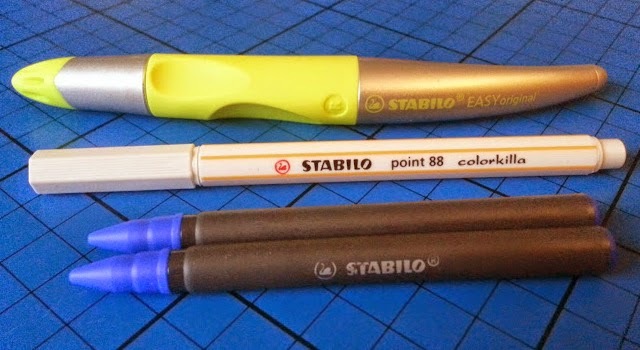 The Stabilo EASYoriginal has been around for a long time. Available in several colours and especially handed to suit. 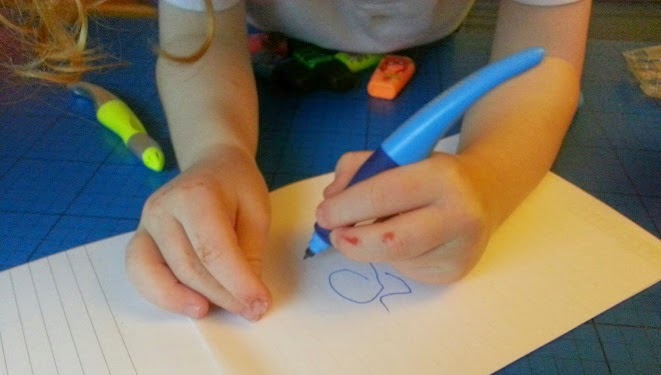 My 6 year old is right handed, and my nearly 5 year old is left handed. 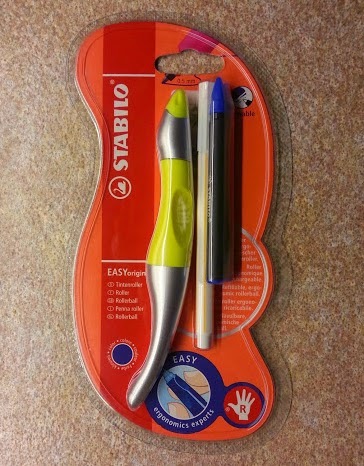 The Easyoriginal pens are the perfect size for both of my boys, and it is instantly easy to see and feel exactly how you should hold the pen because of the shape of the grip. The EASYoriginal is refillable with cartridges. I like this a lot as it's much more environmentally friendly - and cheaper for the consumer - than a pen that goes in the bin when it's empty. Although this is an ink pen with a nib it doesn't run in the same way as felt tips, and it gives a nice clean line that doesn't smear if you are left-handed. The nib is part of the refill cartridge, so if your child is a bit heavy handed you haven't ruined your new pen - something I've previously had to bear the cost for. My children's favourite bit though is the extra pen which came in the pack with the right-handed pen - a Colourkilla pen eraser. My boys have never seen one of these before, and they've learnt the hard lesson that pen doesn't rub out, so this is a real novelty. 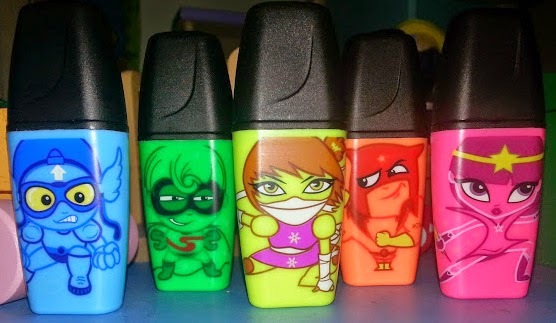 We were also sent a pack of Stabilo Boss Mini Heroes highlighters each for the boys. These are great. Children love highlighters, and I think anyone would love the designs on these. 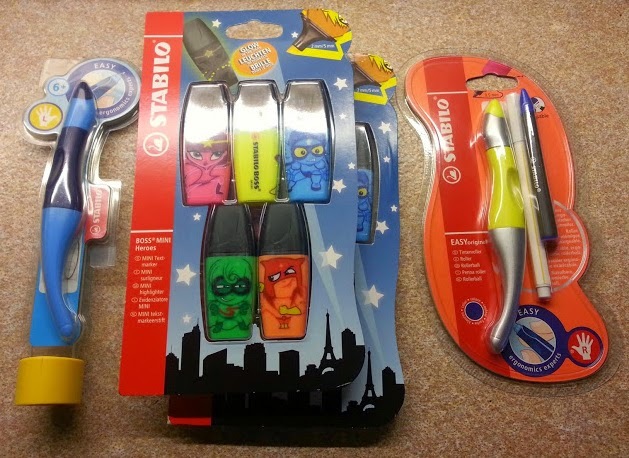 I love the Stabilo range and I think that they make lovely stockingfillers and birthday presents. The pens really do help very much with correct grip, and my 6 year old feels very grown up with his. The EASYOriginals prices are very fair for such good quality products that in my experience last a long time and don't let you down. The Highlighters are a little expensive, but I've bought them myself a couple of times over the years. You know you'll get something that highlights properly and doesn't smudge everything, and they last. We have one of the pens and it was a godsend when Miss A was learning to write. 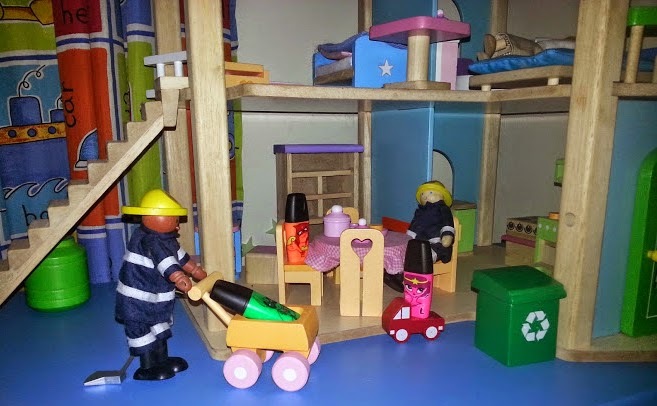 It's such a great fit for little hands. 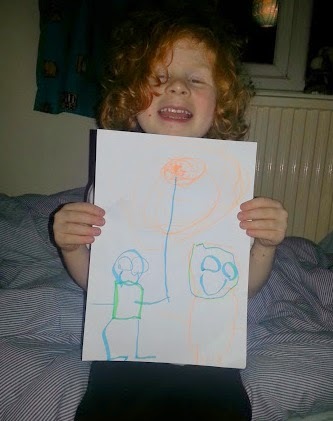 Our son has only just got the hang of gripping his pen correctly and we found the Stabilo pens so useful. I love the look of those highlighters, I quite fancy some for myself! These pens look great. love the design and quality. I had been looking at some of these pens and wondering if it would encourage my boy to write more. They look such a comfy grip, and he too would love to be able to rub things out!